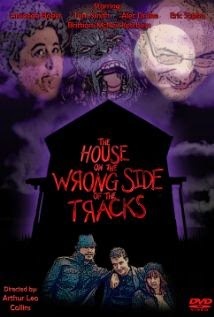 THE HOUSE ON THE WRONG SIDE OF THE TRACKS combines the popular 'Found Footage' genre with the 'TEXAS CHAINSAW MASSACRE' genre of horror. Our heroes/victims are three punks who plan on robbing a house in town and film the entire thing for kicks. Unfortunately for them they chose the worst possible house to perform their crime. Two of the punks are brothers. Nathan (Played by Alec Drake) is the oldest. The younger brother is Ray (Eric Sopko) who is also the guy filming their not very nice deeds. Liz (Amanda Baker) is the girlfriend of Nathan. Nathan is an extremely sadistic character taking obvious pleasure verbally abusing Liz. He leads his girlfriend and brother along for the ride with his overbearing dynamic but sick personality. Ray and Liz are not necessarily bad people. They just seem to be powerless to deny the frightful and eccentric older brother. If Nathan was a nice guy then these characters would probably be getting jobs and bettering themselves instead of milling about and planning bad things to do to people. Nathan is a very compelling and important character. He is unique in this genre portraying someone who comes across as a very young and unsophisticated Joker. He is definitely not your typical teenager in distress type. He is a 'wild card' which makes you want to see how he handles the horrors of what awaits him in the house on the wrong side of the tracks. The film uses the 'Found Footage' gimmick in a unique way. Different perspectives of the characters are explored based on who is holding the camera. The film starts off about a group of punks robbing a home then becomes about a family of psychos having fun with their new victims that have surprised them on one dark cold winter night. When the true horrors begin to happen we see the burglars become the victims. They must try and survive the night and find escape. Meanwhile the family of crazies are having fun with the camera filming their exploits as they torture and kill their captives. The camera reveals the house of horrors from top to bottom exposing what lurks inside the mild mannered home. Watch out for Billy, the gorilla mask wearing son of the family. He is the iconic monster of the film. There is something so unnerving about a guy killing in a gorilla mask. Seriously.....The mask is freakin ferocious. He has an great moment with Liz who tries to befriend him as a way to survive but fails miserably as she freaks the moment she sees Billy's face. Amanda Baker steals the show a bit towards the end with that scene and her escape at the end with her apology when she gets back the camera. Great job. This is a low budget film so there are things to forgive. That is just how things go when you don't have millions of dollars to do what you want to do. I would have liked to see the Nathan character go head to head with the crazy cannibal family a bit more. That would have provided a bit more conflict instead of just showing people tied to chairs getting cut on. RagNBone Productions has made a good little movie that has some interesting and colorful characters accompanied by a great soundtrack by Bleeding Soul. See it for yourself and support independent film makers. RagNBone Productions could be the next big name in horror. You read it here first. sounds fun... you know i love the bad films, they always try harder in the end.